Students will describe what they saw, touched, smelled, and heard in the garden. Students will begin to explore the differences between living and non-living things. Call your students over to a common area where they are comfortable. With a marker, split a large piece of paper into two columns. On the top of one column, write living, and on the top of the other column, write non-living. Ask your students what they think of when they hear the word living. Prompt students by asking, "What do living things need? What do living things do? What are some examples of living things?" Write down student ideas under the column titled living. Make sure students know that living describes anything that has ever been or is alive. Ask your students what they think of when they hear the word non-living. Prompt students by asking, "Where do we find non-living things? What are some examples of non-living things?" Write down their ideas. Explain that the word non-living describes anything that has never been and is not alive. Tell your students that they will be exploring nature outside. Explain that they will be using their senses to see, touch, smell, and hear the world around them. Instruct them to only record items that are living on their Exploring Nature worksheets. 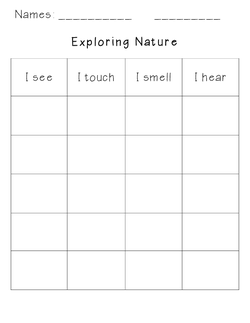 Split the students into partners, and give each pair the Exploring Nature worksheet. Explain to your students that one student will be the recorder who writes the information down on the Exploring Nature worksheet. The other student will be the scientist who searches for living things to be recorded. 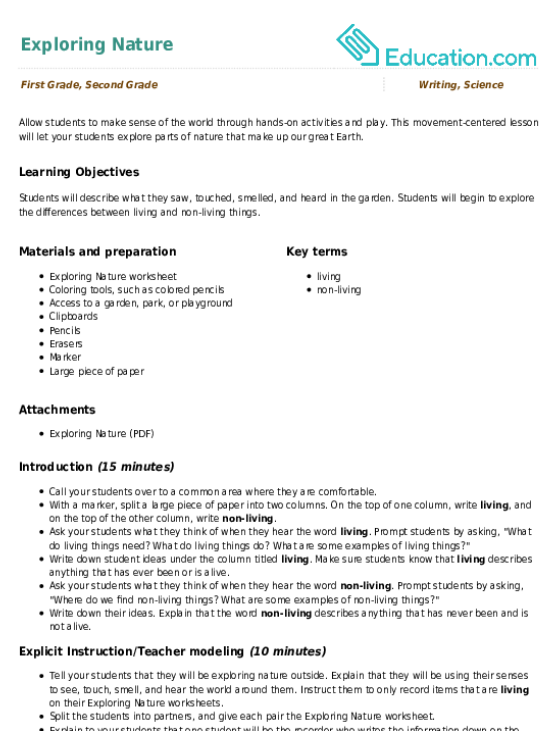 Model this process with a student volunteer. Model writing down what you see, touch, smell, and hear outside. For example: palm tree, rough tree bark, sweet flowers, dogs barking. Have your students head outside with the appropriate clothing and shoes. Ask your students to come to a selected area outside, and have a pair of students demonstrate the process you modeled in class. For example, on a playground, students might write down: bluebird, green plant, sweet flowers, birds chirping. If a student incorrectly identifies something, ask the student to explain their thinking. Explain to the student why the object is actually non-living. Explain to your students that they will have 25 minutes to explore nature and record their findings. Fill out your own sheet as you mingle with the students, and observe their interactions and recording techniques. After those 25 minutes, have your students come back inside. Invite your students to share their findings. Encourage them to illustrate their exploration sheets and draw pictures of what they observed in nature. Enrichment: Students who finish early may design a garden in another country. Potential discussion questions include: What would it look like? What types of plants might be included in this garden? Students who finish early may also create a nature book with illustrations of plants they observed outside. Support: Have students who are unable to write words using sound-to-letter correspondence draw pictures of their observations. Ask your students to share some of their ideas about the differences between non-living and living things. Encourage students to share some of their observations. For example, ask your students to share new information they learned on their exploration. What did you see that was living? What did you see that was non-living? What was your favorite thing you saw? Why? Remind your students that they learned about non-living and living things and explored living things in nature. Tell your students that they will continue to explore these concepts in class. Express the importance of treating living things with kindness, as Earth is our home and must be treated with care.